The new European Commissioner for Trade defended the transatlantic trade negotiations in Paris this week, emphasising the benefits an agreement could bring to French exports and economic growth. EURACTIV France reports. For Cecilia Malmström, the European Commissioner for Trade, the Transatlantic Trade and Investment Partnership (TTIP) represents an opportunity to create more jobs, investment and economic growth that will benefit European citizens. According to the Commission, the treaty would also help to strengthen ties with the United States by cutting red tape and implementing common standards. In a speech to students at Dauphine University in Paris, she hailed TTIP as a “most ambitious agreement,” which “covers everything”. If the Swedish Commissioner cannot give an exact date for the completion of the agreement, she believes the American timetable could be taken as a reference. 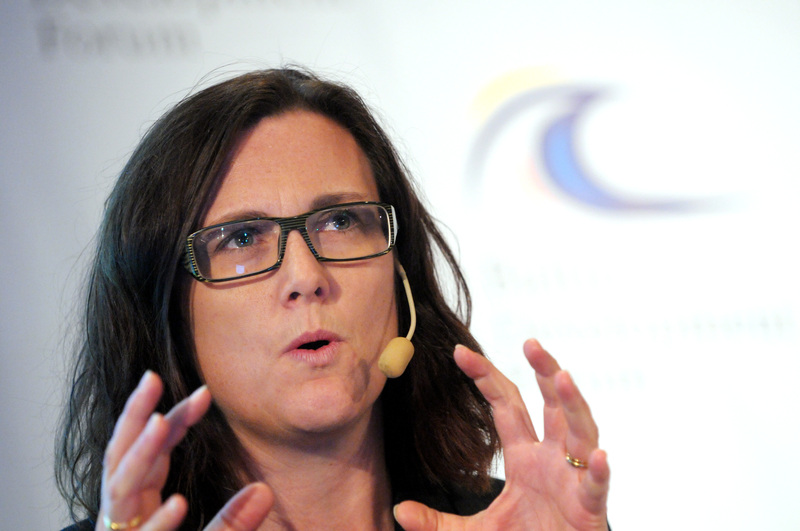 TTIP is one of Barak Obama’s priorities for the end of his presidency, and Cecilia Malmström has been assured by Republican members of the United States Congress that they do not intend to oppose the President over the matter. “The negotiations will not be concluded in 2015, but I believe we can make considerable progress towards the bare bones of an agreement by the end of 2015. Will we manage to finish before the end of President Obama’s mandate? It’s too early to say,” Cecilia Malmström said during the debate in Paris. Malmström also specified that in France “one person in ten owes their job to exports to the rest of the world,” and that they tended to earn “more than the average”. She added that “90% of the increased demand over the next twenty years” will come from “the rest of the world, and not from the European market,” which already receives a large proportion of French exports. In an attempt to dispel French fears over TTIP, the Commissioner said that “the jobs of the future will be linked to trade,” and that shrewd use of economic policy could create “opportunities in France’s strong sectors”. “French businesses will benefit from our efforts to bring the standards of our trading partners into line with our own,” she said, adding that the agricultural sector would avoid any major upheaval. Perhaps most notably, the Commission has agreed to protect the geographical indications on French food products. The Investor State Dispute Settlement mechanism remains one of the main causes for concern in Paris. This mechanism, known as ISDS, is designed to protect companies’ foreign investments against arbitrary or illegal rulings by their host countries. The Commissioner said that she will continue to work on TTIP, in accordance to the mandate she was unanimously given by the 28 member states. “We must not forget that thousands of similar agreements already exist all over the world. France has almost a hundred, so they will not just disappear. We will begin by trying to carry out considerable reforms to make them more open, more legitimate, more limited if possible. If it is not possible, we will have to see”. The extra-territorial application of US anti terrorist and anti corruption laws – and the huge fines imposed to european firms on these basis – raises a major problem for the development of UE/US trade relations. TTIP negotiations should be stalled until adequate guarantees are given by the different US authorities in this respect. The increasing scope of this legislation (closely linked to the evolution of US foreign policy) and the increasing amount of the fines (to the benefit of federal or state agencies) are unsustainable and incompatible with a mutual trust that befit to trading partners. JGG. Already there are many examples of ISDS provisions in other treaties being used by international corporations to challenge policies democratically decided by national governments on the grounds that such policies could adversely affect the profit-making potential of such companies. There cannot be any good arguments for such disputes to be decided by panels of corporate lawyers without judicial review in a treaty between the USA and the EU, both of which have robust and well founded court systems which can be relied upon to make unbiased decisions with appropriate appeal procedures.